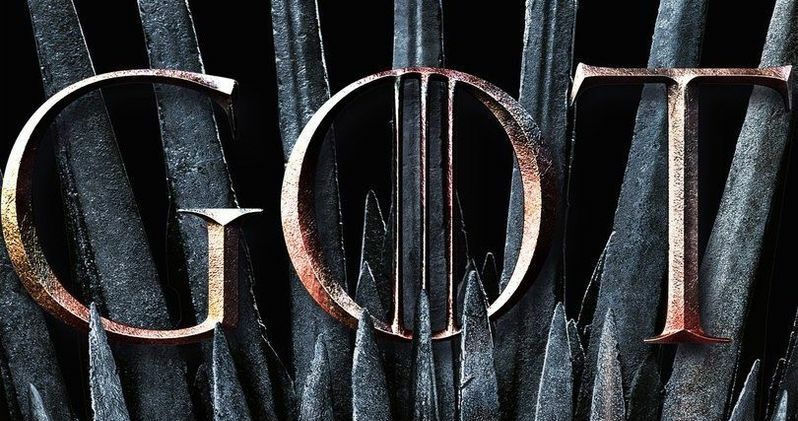 Game of Thrones Season 8 is taking it back to where it all started in the new official poster. HBO released the poster today, which will be the imagery that is plastered all over town on billboards, print ads, and eventually, the Blu-ray boxset. It's a simple poster that brings back the Iron Throne, which has not been on an official season poster since the first one where Ed Stark is pictured sitting on it with his head down. While this is the second time that the Iron Throne has shown up in the official Game of Thrones season poster art, the latest art marks the third time that a dragon has appeared. However, this is different since the dragon is melding with the Iron Throne. The imagery highlights Daenerys Targaryen's quest to conquer King's Landing once and for all. Will she be able to pull it off? That is the question that many Game of Thrones fans have been asking for over a year now. Game of Thrones Season 8 premieres April 14th, exclusively on HBO and we're all ready for the beginning of the end, though if it were released earlier, nobody would complain at all. But, we've all learned to be patient since the Season 7 finale back in August of 2017. Season 8 only consists of 6 episodes, some of which contain feature-length runtimes, but nobody seems to mind all that much. All anybody cares about at this time is finally getting to see the final six episodes and how everything concludes. Jon Snow actor Kit Harington recently revealed that he was on the Game of Thrones Season 8 set until the very end, which has led to speculation that Snow may be one of the last characters standing when the end comes. Harington also stated that he loves the way that the show wrapped up, which is something that co-star Nikolaj Coster-Waldau recently echoed. In the end, it seems that most of the cast has been grateful to be a part of the massive show. Coster-Waldau had this to say. "I am proud to have been on a show that has had this kind of impact and success and relief that it has come to an end in the way that (showrunners) David Benioff and DB Weiss had wanted it to." As for his last Game of Thrones scene, Nikolaj Coster-Waldau says that it was "great" and "absolutely beautiful." The actor couldn't divulge anything else, but like the rest of the cast, he was able to see some pretty amazing things and make life-long friends in the process. While we don't know what's going to happen at the conclusion of the series, it seems that everybody involved is pretty happy with the way everything worked out. As we prepare for Season 8 to premiere, you can check out the official poster below, thanks to the Game of Thrones Twitter account.